Crazy Jungle is a 5-reel, 15 pay line video slots game that invites you to a beautiful jungle full of fruits and animals. A combination of two of these crazy animals can help get the best winning combinations. 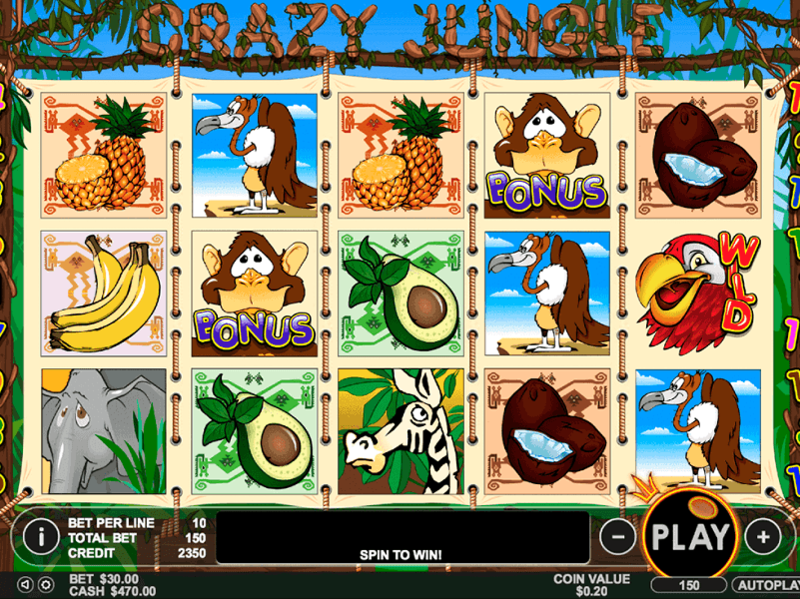 Crazy Jungle Slot is from Pragmatic Play and has some of the best cartoon design seen in the game. The 8 standard symbols include animals such as the tiger, elephant, eagle, zebra and fruits like pineapples, bananas, coconuts and avocados. Special Symbols in the game are the parrot, cobra, and monkey. The animals may be having the most payout but, if you enough pineapples, bananas, avocados and coconuts can as well guarantee a decent payout too. The game offers 15 pay lines that require at least one coin per line whose value ranges between 0.01 to 5 to be activated. When the cobra lands on reels 1 and 5 on the same spin, it activates the free spin feature. This gets the player 5 free spins. If the monkey lands on reels 2,3 and 4 on the same spin, the player triggers the bonus feature. The red parrot substitutes for all symbols except the scatter and bonus ones. If you get 5 wild parrot symbols on one pay line, this acts as a ticket to the Jackpot. This wild symbol, however, does not offer any payout. When 2 snakes appear on reels 1 and 5, free spins have been activated. This gets you 10 free spins. If the snakes appear again together the free spins are triggered again. Free spins can trigger the bonus feature. 3 monkeys on reels 2,3 and 4 activate the bonus feature. This brings a new screen where you get to pick from 3 piles of bananas to win a cash prize that could be up to 60 times your stake. You only get to pick once so choose wisely. 5 lion symbols on a single pay line get you a massive payout of 9000 coins. The zebra gets you between 5-1500 coins while 4 lions get you the third jackpot of 900 coins. The Vulture pays between 3 to 500 coins and the elephant pays 2-250 coins. 2 of a kind get you a prize with a maximum payout of between 80-200 coins. Crazy Jungle slots are easy to play. It looks and sounds really amazing. This and other 5-reel slot games are available online on casino gaming sites. This mobile slots game can also be played on Apple and Android devices for real money of you are tired of playing for free. The no download version of Crazy Jungle is readily available online, start playing now and get to have a fun gaming experience courtesy of Pragmatic Play. Looking for slot games to play online? Try free Black Diamond, New Tales of Egypt and Queen of Gold casino slot machine games from Pragmatic Play. 0 responses to "Crazy Jungle Slot"